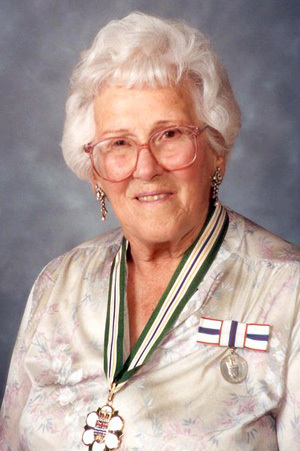 Winnifred Ariel Weir of Invermere is a writer, historian, newspaperwoman and community leader. In the 1930s she organized amateur theatre in Invermere, writing and directing plays such as the annual Christmas Pantomimes of the 1940s which continued into the 1960s. She has published Tales of Windermere, a history novel depicting the life and times of early settlers in the upper Columbia Valley. She founded the Windermere District Historical Society, was volunteer curator of the museum for many years and was instrumental in saving many old buildings and artifacts in the Windermere district. She was a member of her local school board for 14 years, a Girl Guide leader and in 1998 was recognized for 50 years of continuous service to the British Columbia and Yukon Cancer Society.